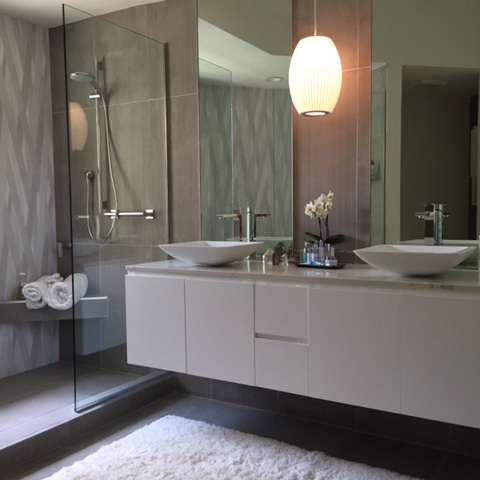 This newly completed master bath serves as the perfect place for a cozy retreat. A calming palette of warm grays and bright whites with plum and violet accents adorns this space, creating an environment of comfort and tranquility, while the textured tile with a linear vertical pattern makes it feel like you are stepping into a bamboo forest. The linear mirrors placed behind the vessel sinks extend all the way to the curved ceiling, giving height to the room. A classic George Nelson from Design Within Reach pendant light gives a warm glow above a gorgeous double vanity with hidden storage. There are two separate showering zones, one on each side and each with its own complete shower system.